It's Thursday and I am on leave till Friday. Enjoying my sweet time with my beloved husben, enche nYomoT. BTW, it just a quick update on our latest DIY project. Inspired by Intan Norazam felt HB. HEHE! How does it looks? Any comments? Your comment for improvements are really appreciated! 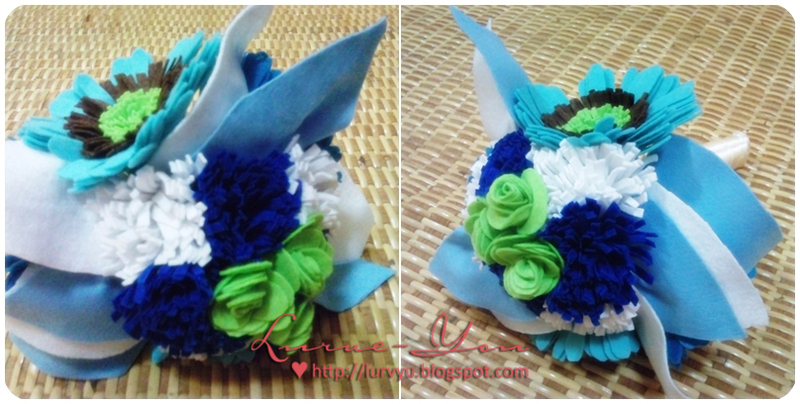 This is a felt bouquet for Cik Puan Suzie. I've promised her for quite some time. Finally, the bouquet is ready! the leaves turns to blue & white. HAHA! Anyhow, thanks a lot for trusting us. Hehh.. I think, I really enjoyed working with felt. I'm thinking of preparing the tutorial for diy-ing this bouquet later. Stay tuned! cantik dear..bertambah cantiknye bila u pandai ubah dr yg asal, like ur own version dear..
tunggu i buat tutorial ek..?? amek masa sket sbb aritu tak buat tutorial. so kene buat semula. akak! nnt sy buat tutorial die kehh.. kene wat semula, amek gambar satu2..